The Temple is praised in the Thevarm hymns of Saint Tirugnanasambandar. This is the 21st Shiva Temple of Thondai region sung in Thevaram hymns. 1. Chithirai Brahmmotsavam in April-May. 2. Thai Kruthikai in January-February. Devotees pray to Jupiter with yellow vastras on Thursdays for relief from adverse aspect of the planet. Presiding deity is a swayambumurthy. The vimana tower above the sanctum sanctorum is of Gajabrushta design means the back end of an elephant. Lord Vinayaka of the temple is praised as Varasiddhi Vinayaka. 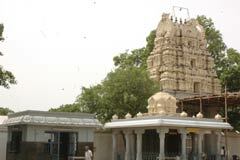 The Rajagopuram of the temple is of made of three tier design. Prayers : People pray to Lord for removal of obstacle in wedding efforts, good health and remedy from illness. Devotees pray to Lord Dakshinamurthy with yellow vastras seeking wisdom. It is believed that prayer on full moon day will grant total salvation. Planet Jupiter incurred a curse of Menaka, wife of his elder brother. As advised by Rishi Markandeya, he reached this place, had a dip in the sacred spring and worshipped Lord Shiva and gained relief from the curse. It is the faith of the devotees that praying to Jupiter in this temple would be an effective remedy for relief from sins. According to history, Lord Vinayaka married Kamali and Valli, daughters of Lord Brahmma. This is supported by the procession idol of Lord Vinayaka in this wedding form. 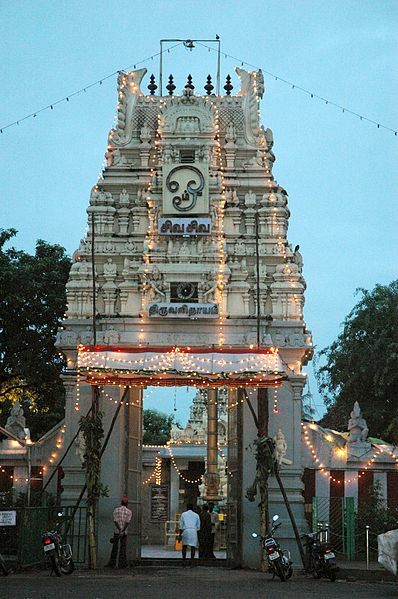 The temple assumes more importance as it is situated around 11 sacred places as a garland. It is the staunch faith of the devotees that a visit and worship in the temple would benefit them with total salvation. Jupiter shrine in the prakara is facing Lord Shiva?s shrine with another shrine for Sri Anjaneya in a worshipping form. Lord Shiva is entitled for all pujas He is praised as Bali (puja) Thayer is entitled and praised as Bali Thayer. Bharadwajar, son of Jupiter was born as the son of a sparrow (Kari Kuruvi) also Valian in Tamil. Saddened by his birth as a sparrow, he worshipped Lord Shiva in many sacred places. When he came to this place, he found a Shivalinga under aKondrai tree and worshipped Him. Lord Shiva appeared before Bharadwajar and made him the leader of birds. Based on this story, the place is called Valithayam and the Lord Valianathar.